Product Description- Rescue your skin from winter woes with Lakmé Peach Milk Moisturiser, a potent blend of peach and milk which moisturizes, nourishes and protects your skin. Nutritive Moisture Technology implants each epidermal cell with intense moisture giving it a radiant glow & a natural blush. On the bottle, it has been written that Nutritiv Moisture Teachnology has been used to create this moisturizer for the face. This Lakme moisturizer comes in a silvery white bottle with a peach colored flip-top cap. I prefer to put a sellotape on the cap, if I take it on travels with me. The cap is basically not so tight and thus there is a risk of spillage. The moisturizer is really light pinkish in color and smells really mild- just like baby lotion! The fragrance won't bother those with a sensitive nose. The lakme peach milk moisturizer, unfortunately, contains parabens, silicones, mineral oil- some harmful ingredients for the skin. However, if you have oily skin, this won't control the oil secretion and my face starts become oily in just two hours or so. But then the Lakme peach milk moisturizer for oily skin is a good choice as it is non-greasy and gets absorbed into the skin really fast and really nicely! It will provide mild hydration to those with dry skin. Basically, this would suit those with normal or combination skin the best! Although it contains a huge list of chemical ingredients, it did not break me out. My skin felt really nicely moisturized and healthy too! 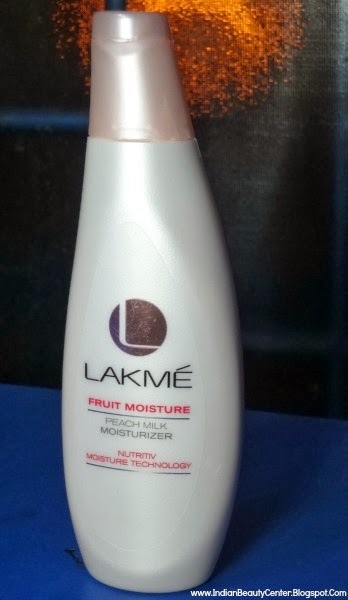 Lakme peach milk moisturizer for the face is a bit above average and kind of does its job well- at least better than most of the moisturizers available in the market. Plus, it is pocket-friendly too! Final verdict- I have to say that this moisturizer did keep my skin soft and supple. Actually, I find it very difficult to find moisturizers for my oily, acne prone, sensitive skin but this cause not irritation to my skin! However, dry skinned beauties, you would need something better and more hydrating. Overall, if I have to say, I would say that this moisturizer from Lakme is worth a try! I have tried this long back didnt liked it...im oily and it makes me super oily! Even I have tried it and din't like it much. Nice clicks, I have tried the one with SPF and really like it. Nice review..
such a wonderful product! I need to try it out! Thank you for the review! It was very informative! i shall try this in winters,,,may work then.. nice review dear! !